Are you ready to gain confidence, experience a willing and cooperative partnership with your horse, and improve your horsemanship skills? You love and enjoy your horse but find yourself STRUGGLING! >>> You can’t get your horse into the trailer! >>> Your spooky horse is destroying your confidence! >>> Catching your horse is frustrating and nearly impossible! Maybe you’ve participated in clinics, only to be left discouraged by the lack of personal attention or direction from the clinician. Maybe you have taken your horse to a professional trainer, but you’re still confused trying to apply all the information you’ve learned after getting your horseback. Perhaps watching videos has helped, but you still have many unanswered questions. >>> Communicate in a language your horse will understand! >>> Use positive reinforcement effectively! >>> Create a calm and confident horse! >>> Get outstanding results during your training session! >>> Develop a deeper bond with your horse allowing you to truly win their heart! If your goal is to get your horse working in harmony with you instead of leaving you frustrated and wanting to pull your hair out, you’ve found a friend who CAN SHOW YOU HOW TO GET THE RESULTS YOU DESIRE without using force, fear or intimidation! >>> Imagine being able to save time & teach your horse something in a brief period of time! >>> Imagine your horse catching you and looking forward to working with you! >>> Imagine being able to communicate in a clear language that your horse understands! All of this is WITHIN YOUR REACH, and now you ABSOLUTELY CAN get the help you need from the privacy of your own home! Why Should You Work With Kim Wende? 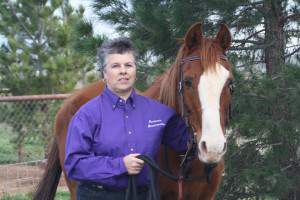 I have over 40 years of experience working with horses and have been very successful at equipping owners with the knowledge and skills needed to advance in their horsemanship capabilities and confidence. I care about you and your horse. Nothing gives me greater pleasure than knowing I can teach you how to achieve true connection and harmony with your horse like I have enjoyed with mine! This course is for anyone who is interested in learning how to use positive reinforcement to increase connection, communication, and collaboration with their horse. Positive Reinforcement is perfect for beginners. It is also an excellent addition to the toolkit of more experienced horse owners who want to achieve better results with their current training methods. This Six Week home study course is designed to provide you with a step-by-step approach that will help you get results using positive reinforcement either as a primary tool or as an enhancement to your current method of training. Used correctly, positive reinforcement is like fine-tuning your communication skills and nothing will do more for your horsemanship than communicating with your horse in a clear and effective way. This course will show you how! In this module, you’ll learn what positive reinforcement is and how to use it effectively with your horse. You’ll also learn the most important things you must do in order to be successful with your horse… it will make a huge difference. In this module, you’ll learn how to teach your horse to lower his/her head into the halter. You’ll also learn why it’s important to be able to touch your horse all over. Being able to touch them all over is laying the foundation for acceptance and trust. In this module, you’ll learn how to get your horse to easily walk beside you and match your cadence with slack in the lead. In this module, you’ll develop two-way communication with your horse, and learn how to build your horse’s confidence as well as your own. In this module, you’ll learn how to get your horse to back easily with slack in the lead – no tugging or pushing required. In this module, you’ll learn how to get your horse to step on and go over the bridge. Bridge work builds confidence and helps to prepare them for trailer loading. By enrolling in this course, you will ALSO be granted EXCLUSIVE ACCESS to the Passionate Horsemanship VIP Facebook community where you will find personalized support, resources, and valuable tips to enhance and develop your relationship with your horse! “Positive Horse Communication 101” provides you with the foundation for understanding how to effectively use positive reinforcement training with your horse. Positive reinforcement training is a very powerful communication method that will motivate your horse without having to resort to methods that escalate pressure and cause resistance. You can have a horse that actively and willingly participates in the learning process. This approach is a method you and your horse will both understand and enjoy. This course is 6 weeks in length and includes video lessons and PDF files designed to help you fully understand how to apply what you learn. Each lesson has a homework assignment so you can practice the skills and get the most from the course content. **As part of the Enrollment Process, students must accept the Terms and Conditions. I understand that by proceeding and paying for this course I will be accepting the Terms and Conditions of Passionate Horsemanship’s Online Course.